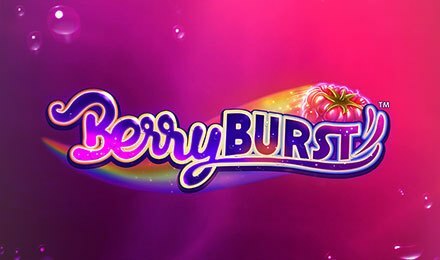 Be ready for a delicious treat on Berryburst Slot by NetEnt! It is now available at Moon Games, made up of 5 reels and the Cluster Pays™ engine. When you load the game up, you instantly notice the vibrant colours and delicious fruit symbols. Thus, you have all the ingredients for a refreshing summer cocktail! While you enjoy the sight, you can also listen to an upbeat soundtrack. Set against a reddish backdrop, the reels consist of symbols like Lime, Berry, Orange Slice, Raspberry, Heart, Diamonds contained in bubbles and Spade. Relish this game on any type of device! Get started on Berryburst Slot by selecting your preferred coin size using the + and – buttons on the Coin Value display. The Level field allows you to choose your desired bet level. Clicking on the Max Bet tab lets you pick the highest betting amount in one click. Ready for a visual treat? Simply hit the Spin button! With the Auto Play function, enjoy up to 1000 spins played in rapid succession. Bet Levels: Play with 1 to 10 bet levels. Amount of Paylines Selection: Paylines are not available. Instead, the Cluster Pays™ engine is used. Coin Values: Betting options range from 10p to £200 per spin. Berryburst Slot uses the Cluster Pays™ engine, which means that clusters of 5 or more symbols must be created to trigger a win. The Wild symbol expands on any reel and stays in place while the others re-spin. When the Expanding Wild shows up on any reel, it triggers the Re-spin Feature. If one or more Wilds appear during the feature, you can earn an extra re-spin. This results in the 5 reels being completely Wild, rewarding you with 500x your stake. In addition to this, continuous re-spins can lead to a maximum payout of 1868x your total stake! The Ice Cube on Berryburst Slot stands for Wild and substitutes for any symbols to complete winning combinations. Feast your eyes with the colourful fruits while playing Berryburst Slot at Moon Games. All the best!